Molly Stiles has recently relocated to Misty Bottoms, Georgia, from nearby Savannah and opened a bridal boutique, That Little White Dress. Her shop is her focus, and things are right on target. According to her plan, she will devote the next three years to making the boutique a success. Once she has reached that goal, she can concentrate on finding personal happiness. She allowed love to detour her from her plan once, and the failure of that relationship has left her more determined than ever to stick to her agenda. Brant Wylder may be the stuff a girl’s fantasies are made of, but since he is only in Misty Bottoms for the wedding and will soon be returning to Tennessee, it should be safe to enjoy a dance and a kiss in the moonlight. Brant Wylder has a dual purpose for being in Misty Bottoms: attending a friend’s wedding and scouting locations for a new location for Wylder Rides, the vintage car restoration company he and his brothers own. Brant has seen several of his friends marry recently, but with the expansion plans he and his brothers have for their business, he doesn’t have time for romance. He admits to himself that the curvy brunette who owns the local wedding boutique is a temptation, but only after assuring himself that distance will see that his attraction stops with flirtation does he follow her into the garden. Brant and Molly’s romantic moment is shattered by a phone call telling Brant that his sister Lainey has ended five years of sobriety, had a DUI accident, and is in a Savannah hospital. Brant doesn’t know the details of Lainey’s condition, but he does know that he is the family member closest to the hospital. He needs to be there for Lainey and to see that her son, seven-month-old Jax, does not end up in foster care. He leaves without even saying goodbye to Molly. Brant assumes temporary custody of Jax while Lainey recovers and enters rehab. His stay in Misty Bottoms is going to be longer than he anticipated. Clearly, Brant needs a friend, and Molly is there for him. The more time they spend together, the more deeply they fall in love with each other and with young Jax. But Molly will have to accept that love does not operate on a timetable before she and Brant can claim their HEA. 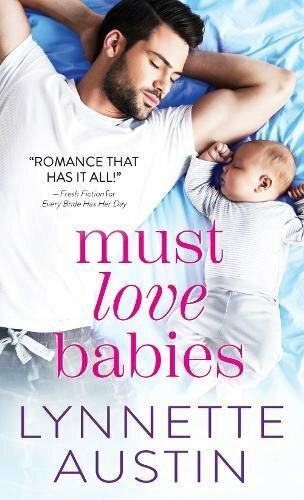 Austin returns to Misty Bottoms, Georgia, the setting for her Magnolia Brides books, for this first book in her Bachelors and Babies spinoff series. The setting is a big part of the novel’s appeal, even if the town’s eagerness to lend a helping hand to a non-native does seem more ideal than real. Molly is likable and sympathetic even though her life plan, made when she was barely in her teens, comes across as an unlikely shield against love’s potential to wound. But Brant is the real star of the novel. In his relationship with Jax, he moves from the conventional sigh-worthy romance hero to a guy struggling with a real crisis, one for which he is ill prepared but which his heart and deep family loyalty mandate he give his all. Austin paints a realistic picture of what life with an infant is like and of the way Jax stakes his claim on Brant’s emotions and on his time. Jax makes Brant a different man. Austin is a strong writer, and this is a book rich with heart and charm. If the romance seems rather simple in contrast to Brant’s family relationships, that is a forgivable flaw in a book that will delight fans of small-town romance. Two more books are scheduled in this series: I’ve Got You, Babe (February 2019) and For Baby and Me (TBD), presumably featuring the other Wylder brothers along with appropriate heroines and babies. A reader can only hope that they are as engaging as this first one, and this reader will also hope to see more of Molly and Brant and maybe catch a glimpse of a growing Jax. Sounds like an interesting start to a new series. Thanks for the review.